Imagine a word processor where all you can do is type. Where, while using the program, there’s nothing to fiddle with, no options to change, no preferences to tweak. A text tool designed to force you to focus on your writing, and to prevent you from worrying about anything else. iA Writer (Mac App Store link) is that tool—no settings, no toolbar, nothing but a blank virtual page on which to type. The philosophy of iA Writer is simplicity. As the company’s webpage says, “thought goes into writing, not using.” For example, Just as Henry Ford would sell a car in any color the buyer wanted as long as it was black, iA Writer lets users type in any font they want as long as it’s Nitti Light. It’s an attractive, monospace sans serif font, and it’s available in one size, with preset line spacing, unjustified lines, 64 characters per line, on a light-grey background. Of course, this approach works only for those who buy into the concept. Writer’s display works well for me—with my aging eyes, I generally use large font sizes, wide line spacing, and a non-white background when I work. But people who prefer different types of fonts, or different sizes, or—especially—proportional fonts may be put off by a text editor that imposes such conditions. 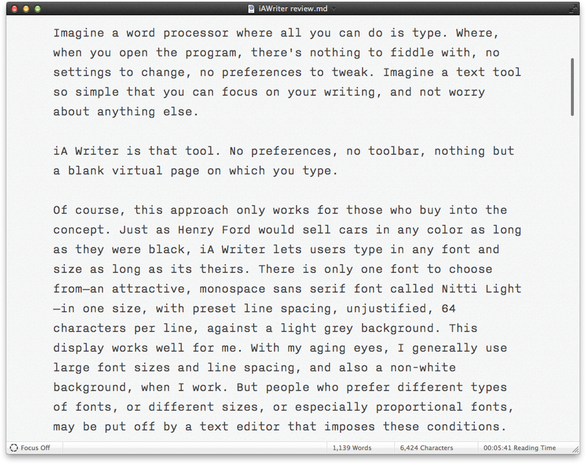 The enforced-simplicity concept extends to two features of Writer that allow users to focus entirely on their writing. The first is full-screen mode, which is common in a number of writing tools these days. In this mode, you see nothing on your computer screen but the text you’re writing on the grey background. There are no windows to distract you, no tweets, no emails, no webpages. Writer's full-screen mode is excellent, allowing you to block out the main distractions on your Mac’s screen. The second feature is “focus mode,” which, when active, dims all the text in your document except the current sentence. In other words, the sentence you’re typing is displayed in black, with the rest of the text in a medium grey. According to the developer, this mode allows you to focus on the specific text you’re actively writing. The program even provides keyboard shortcuts (Command-Option-left arrow and -right arrow) to navigate from sentence to sentence. Personally, I wasn’t a fan of focus mode. Few writers that I know actually write sentence by sentence. To use a chemistry analogy, a sentence is an atom and a paragraph is a molecule. Just as atoms have value only when they form molecules, individual sentences are meaningful mainly when combined with other sentences—they depend on the surrounding text for context. I would prefer if focus mode would at least highlight several sentences before and after the active one, if not the entire paragraph containing the active sentence. If you must have formatting, iA Writer uses Markdown syntax for, for example, underlining (asterisks around text), bold (double asterisks around text), and headers (one or more # symbols)—add these control characters and the formats are immediately applied to the designated text. The advantage of using Markdown for an app such as iA Writer is that you can apply formatting without having to use any menus or buttons (though you can use standard formatting keyboard shortcuts—Command-U for underline and Command-B for bold—and Writer will apply the asterisks for you). The drawback is that while surrounding text with asterisks, for example, does indeed underline it, the asterisks remain visible, as well, which can be confusing. Formatting characters disappear only when you export a file to RTF and open it in another program. And if you want formatting without Markdown, you’re out of luck. Writer supports OS X’s built-in spell checker, and in the footer of the Writer window are a few basic document statistics. You’ll find the usual word and character counts, along with a metric called reading time, which is an estimate, based on the number of words in the document, of how long it would take someone to read it. If, like me, you often write to word counts, these numbers are great information to have. Unfortunately, they fade away as you type—the whole distraction-free thing again—and you need to click the mouse somewhere else in the window to view them. 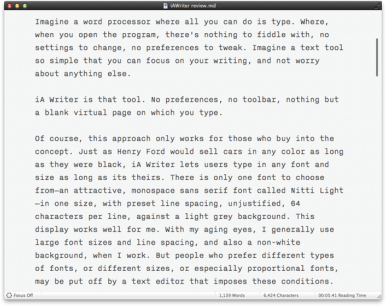 The latest Mac version of iA Writer shows its iPad-app roots in support for cloud storage. When saving a document, you can choose to save locally on your Mac, or, if you plan to work on the document on other Macs or on an iPad, save to iCloud or Dropbox. Documents you save to iCloud or Dropbox using the Mac version can be accessed from the iPad version, and vice versa. I appreciate Writer’s focus on simplicity, though I do wish it offered at least three font sizes—given that each line is limited to 64 characters, regardless of your screen size, there’s not a lot of text on the screen at any given time. I’d like to be able to view more text at once, especially when I’m working on a long document and need to move things around. In keeping with the minimalist philosophy, there are only a few actual features I’d add. First, I’d prefer a few choices for background colors. The pale gray of iA Writer seems a bit insipid, and different people’s eyes react in different ways to colors and contrasts—I prefer a sable background when I write in BBEdit, and I know others who like a pale-blue background. I’d also like to be able to export files to plain text, rather than only RTF or HTML. Finally, I’d like to be able to apply basic formatting without adding Markdown’s control characters. Given that the program exports to RTF, it could presumably handle such features. That said, iA Writer’s inflexibility is its biggest asset. If you like its simple approach, you won’t want to change anything. However, the program is available only through the Mac App Store, and the developer offers no downloadable demo, so you can’t try it out to see if it works for you before purchasing. If you’ve got an iPad, I recommend first trying the $5 iPad version of iA Writer. If the app’s minimalism agrees with you, you may find that the Mac version’s similar simplicity frees your mind from the many confusing features in traditional word processors, and the many distractions on your Mac, letting you do what a tool like this is designed for: writing. Senior contributor Kirk McElhearn, the author of Take Control of Scrivener 2, writes about more than just Macs on his blog Kirkville. You can also follow him on Twitter.